A lot of things have been said about Jay Simpson, here and anywhere else the Union are discussed. And almost all of it has been negative. To be fair to him though he wasn’t the one who brought in a player with no history of succeeding as a lone striker. And until recently, his lack of compatibility with the way the Union played was a great weakness, both for him and the team. But by the time he got his start against Sporting Kansas City this Sunday, something had clearly changed. It could be that the Union attack had learned to be more versatile that it had been in the past. Or maybe Simpson found ways to be contribute in ways that don’t rely so much on getting good service. Probably it’s both. With the game three quarters over, Simpson scored the first goal of the game (and only his second for the Union ever) off the volley. Shots like that are as much about luck as they are about skill, and it wouldn’t have been his fault if the ball had gone over the bar or straight at the keeper. But if anything, that counts to Simpson’s credit, especially on a team like the Union who have a history of being unwilling to take a shot on less than ideal opportunities. The second goal though was all skill. Not in the shot itself, that was solid fundamentals but nothing exceptional. Instead it was the setup that showed the Englishman’s skill. Both he and Alejandro Bedoya were onside and in position. Both understood their roles, and they both executed perfectly. That’s representative of Jay Simpson’s complete game on Sunday. He knew his job and did it. It would have been easy for him to write off this team that hasn’t given him the chance he wanted, or this game that clearly wasn’t a must-win for the Union. 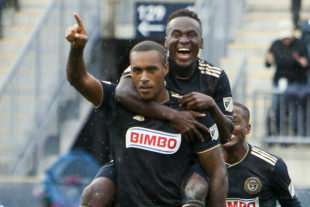 But he stepped up and did an amazing job giving the Union three valuable points over strong competition. Quick edit, but I believe you misspelled the last word in the headline — it is correctly spelled with an “a” and not a second “e”, despite the fact that he had a very nice half hour on Sunday. Kudos to Simpson. I’ve always thought he was both a victim of circumstances and not given a fair shake. I thought he looked good for most of Sunday’s game. He’s a much different player than Sapong. He looks more sharp and slippery, whereas Sapong is more of a blunt force weapon up top. With time the team might have figured out a better way to use him. Will be interesting to see if he builds on this with the team or elsewhere.